How Much Does SharePoint Cost? One of the top questions you’ll ask if you’re looking at deploying a SharePoint solution for your organization is – how much is this going to cost us? While the exact answer depends on the size of your business and what you want from SharePoint, this post will look at the cost of entering the SharePoint sphere. There are many options available and many variables that may come into play here – so the figures we are giving are not designed to cost a solution down to the last cent – rather to give you a “ball park” idea of what each level of the SharePoint solution is likely to cost, and perhaps more importantly the size of the steps between each level. Server Licenses: SharePoint is a server application and whatever level of SharePoint you are running you will need one or more server licenses before you can run the software. SharePoint License: In addition to your server license you will need a SharePoint license. CALS: Client Access Licenses: These allow users, or devices (desktops/laptops etc) access to your SharePoint server, and you will need one for every user/device you wish to grant access to. External Connector License: want to use SharePoint for your public facing website? After all, it’s free right? Wrong? Clearly you can’t use CAL’s to give access to users of a public facing website, so instead you will need an External Connector License. Microsoft’s pricing guidelines on these helpfully state “Varies” – (thanks Bill!) You should budget at least a couple of $k, and potentially much more, depending on the size of your installation. We have not factored the External Connector License into our price estimates here. Finally, you will want to think about hardware costs. Here we are simply discussing software costs and it may well be that in order to implement your desired SharePoint deployment you are going to need additional hardware as well. Now, before we get on let’s have a little clarification on the 3 levels of SharePoint – because Microsoft does like to change the names fairly regularly. There is relatively little difference between 2007 and 2010 in terms of the pricing models, so in this article we have stuck with the 2010 terminology. SBS comes with five CALs as standard. This allows five users or devices access to the server and you’ll need to figure out if you might need more than this. Additional user or device CALs cost from $44.00. There are two types of CAL – a user CAL is restricted to an individual while a device CAL is restricted to one device. Device CALs might make sense if you want to assign multiple users to one device, such as shift workers. User CALs are a good option if you have roaming employees who need access to the corporate network from mobile devices or employees who use multiple devices on your network. Foundation is a comprehensive solution at an affordable price for small businesses but you miss out on sophisticated features like document workflow and content authoring. If there is one piece of ‘missing’ functionality that exists in the standard solution, you could look at enhancing Foundation with custom code or buying a third party tool rather than upgrading to Standard or Enterprise. If your organization has more than about 25 employees, you may need to look at buying SharePoint Standard, previously known as MOSS. SharePoint 2010 Server costs from $4,900 and a single license for the Standard edition is priced from $7,389. This option provides the core capabilities of SharePoint; sites, communities, content and limited search and composite features. You will need to buy additional standard CALs for MOSS and the Standard edition of the software. For this option, user CALs cost from $125 and device CALs cost from $142. Do bear in mind that this option is only for one server – you may need to invest in licenses for additional servers as your organization grows. This option will fulfil your demands if you have thousands of employees in your business and ball-park estimates for a server license range from $57,000. This option delivers the full range of features with additional search, composites and powerful data insights. Again, you’ll need to invest in user or device CALs and an additional FAST search server license from $22,000 if your organization demands it. So we can see that even with SharePoint there really is no such thing as a free lunch – even “free” Foundation will come at a cost for most of us. And we can also see that the gaps in pricing between the different levels are pretty huge. So what are your options if you find that the SharePoint level you are currently using is no longer giving you quite enough functionality? Well you could dig deep into your corporate pockets and go for a full upgrade. Or you might consider looking at 3rd party add-ons that fill your particular functionality gaps at a fraction of the price. For example, if you are happy with Foundation, but need more advanced filtering capabilities you could cough up $12,000+ for a full upgrade to MOSS, or you could simply buy a 3rd party SharePoint Filtering product for around $500. 3rd party add-ons exist to fill many of the gaps in SharePoint functionality and can represent a cost effective alternative to a full upgrade to the next level. I hope this post helps your quest to figure out how much SharePoint will cost your organization and I’ve added some useful links for you to check out below. 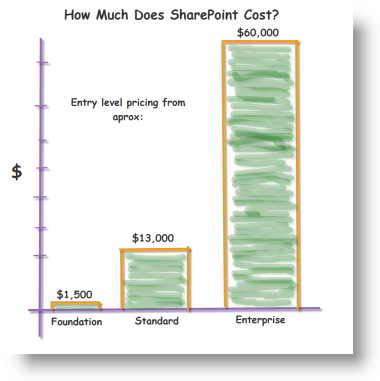 How much has SharePoint cost you so far? Let us know if you’re feeling brave! good overview! I notice, that Microsoft is (again) trying to evangelise the use of SharePoint as a WCM to build public facing websites. This requires additional licenses (SharePoint Server 2010 for Internet Sites) which you missed to put on your list. Caution to users: You must not use these licenses for your intranet. So you probably end-up buying both license types if you wan’t to use SharePoint as internet WCM. – the power of a best-in-class CMS platform, to quickly build dynamic, robust and sustainable web-projects with little effort. What do you think, is SharePoint becoming a serious contender on the internet, or did you leave out these licenses on purpose? @ Bernard, thanks for the heads up. We do mention the External connector license, and I think we make it clear that SharePoint is not a “Free” option for externally facing websites. But generally in this article the externally facing sites were not our core focus. Just to clear things out here on the public facing web site. Yes, SharePoint 2010 in std. and ent. versions required pricy license. And yes, there is a required External Connector license of a cost of aprox 1.999 USD on top of that.. However, there’s a way to get of cheaper! If you take a Windows Server 2008 Web Edition and SharePoint 2010 Foundation that runs with the SQL Express 2008 you get of for free. @SPGuy – an interesting option but AFAIK that only allows you to use SharePoint with anonymous users (i.e. public facing and no login) and NOT as extranet/intranet). @Ryan – good point that only anonymous user will be an option. But I will challenge that and go with the option of having Form Based Authentication enabled running on a ASP.NET Membership database. That might just make a fine extranet. However – I basically not a fan of everything is free and we have decided not to own a server again in our company. We are in the cloud and it’s cheap and someone else has the worries of servers and licenses. We on the other hand have almost unlimited access for external users, anonymous access to our SharePoint 2010 Foundation sites – all at a very low monthly price that we are happy about. Thanks again for an enlightening post, but I think the real cost of SharePoint needs to be measured in conjunction with the adoption costs. Just because you bought the hardware and software does not mean that you have a successful platform. For Enterprise clients it means still many thousands in training, consulting and internal resource fees to successfully implement SharePoint. The product is much too big for any business to take one without specialist services. @Veronique – you are absolutely right of course – without the training, adoption and governance plans its going to be a dead duck. However people do still want to know what the actual software is going to cost them – and that’s a question that you may struggle to find a straight answer to on the web – so I hope we have been able to help out a little there. \The end user license agreement is within the installer. Conclusion: If you want to save Dollars by using SPF for public facing websites, you must neither use the content management functionality nor the content publishing functionality of SharePoint. So where is the beef? I hope this is a valid bottom line wrt to the SPF/CMS licensing confusion. @Bernd. To be honest I am a little confused, and I don’t really get what your point is here. Which does kind of highlight just how confusing and difficult to get to the bottom of this whole area is. Which was why we wrote the article in the first place! This paragraph is confusing to me. It says that the SBS is bundled in WSS 2007 and then at the end says it costs $1,428. Is it free with WSS 2007 and costs only $1,428 if you buy it separately? He is saying that it is available for free to people who have Windows Server licenses (and is bundled in Small Business Server). It is not available for individual purchase at all. The cost listed is the cost of the server license. Is there anything else of the kind of Sharepoint for a home base small (very small) business? Hi, I have a question regarding licensing MS SharePoint Foundation. What about the situation I have one server, MS SharePoint Foundation, no AD (only Windows server local users), SQL Express, some authenticated users (local Windows 2008 server users). I want them to authenticate from Interent and Intranet too. Is it possible to use Windows server web edition (MSF + SQL Express at one machine) or Windows server 2008 standard at least is necessary? Is there any license for Windows server 2008 per processor? I am looking the cheepest solution for about 100 users without Active Directory. Hi Petr – Your best approach is to contact whichever reseller supplies your Microsoft licenses for specific detailed advice about your individual scenario. I try to understand how cost exactly sharepoint for my company. I need sharepoint for pubblish on Web some Business Intelligence Dashboard (by Sharepoint Performance Point). I need enterprise license? (60.000 usd it’s too expensive). @David – thats far too in depth a question to give a simple “Do X, will cost you Y” on a forum. Get intouch with a local IT services company or licensing specialist who should be able to unravel it for you. How can i know if i have a CAL in existence in my organization as i want to deploy an application that would require SharePoint Foundation. And i want to be sure the license has been taking care off before i commence my installation.